Your little ballerina will dance with joy when she spies this sweet friend. 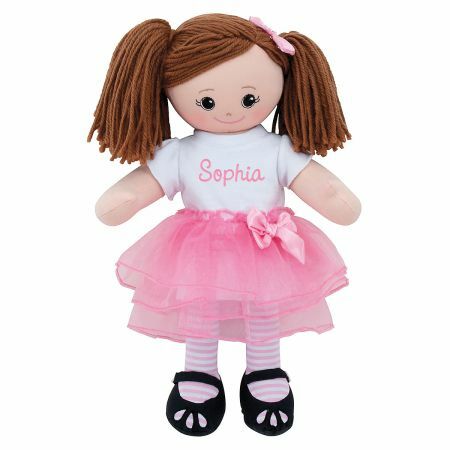 Embroidered with you child’s name, pretty keepsake rag doll comes dressed for her recital in a removable tee-shirt, bloomers, and bow-trimmed tutu, featuring a hook and Velcro® closure. Removable “Diamond”-studded hair clip and embroidered heart on the heel complete the look. Yarn hair; 16"T. A gift she’ll cherish, for ages 3–8. Specify child’s name up to 9 characters.